Wild Card Wednesday: (How to) Sharpen your knives! One of the first articles I posted was about one of THE most important kitchen tools…a good quality chef’s knife. A brand new knife is amazing but, what happens when it starts to dull? Not so amazing anymore. Plus, a dull knife is actually more dangerous than a sharp knife because you end up having to use more pressure to cut through something, which inevitably sends food flying off the board and the knife chopping your fingers instead. The good news is, quality knives are meant to be sharpened and it’s pretty easy to maintain a sharp edge. And now-a-days, there are some very affordable products that do most of the work for you, quickly and painlessly. Those with slots containing various levels of (knife safe) abrasives inside. The abrasive material removes small pieces of metal as you slide your knife through, reshaping the sharp edge. 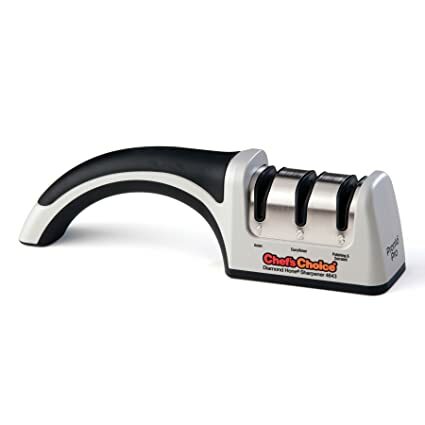 The Chef’s Choice sharpener (seen below), uses diamond abrasives and is very versatile. It can be used on European/American/Asian Style kitchen, sports or pocket knives. The second type of manual sharpener is like the MinoSharp version shown below. It uses ceramic wheels and water to do the job. It has 2 different levels of ceramic abrasives (in wheel form) to remove the excess metal. This goes one step further than your average manual sharpener and rinses the pieces of metal away with the water as you sharpen. I use one very similar to this one and love it. Electric sharpeners do the same thing as the manual ones. The difference is they are motorized so you hold the knife and let the abrasives do the work. They work well, for the most part, but depending on the shape of your knife (namely, those with a large bolster), your knife may not fit properly and the knife can become unevenly sharpened. Also, they cost quite a bit more than the manual versions. 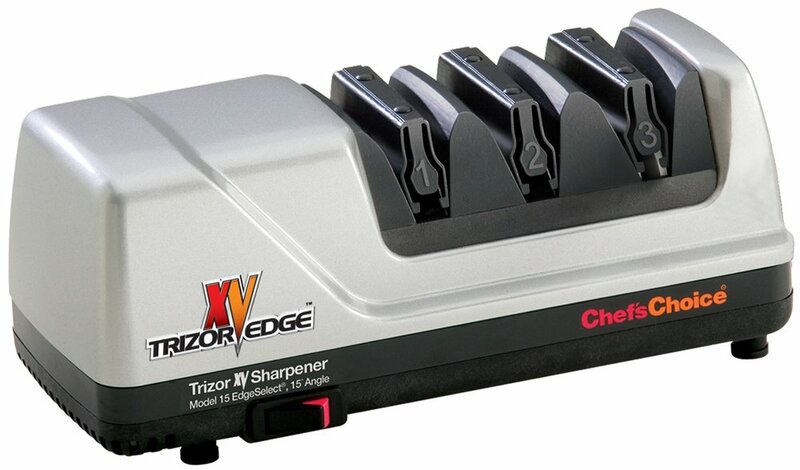 If electric is what you want, Cooks Illustrated (the authority on all things tested and perfected) recommends the Chef’s Choice Trizor Edge shown below. Sharpening Steel (a.k.a, the steel rod found in knife sets): This is actually NOT a sharpener. It’s purpose is to hone your knife. WTF does that mean? Think of if as a knife file. It doesn’t remove metal from your knife (like a sharpener does). It reshapes a dull edge, creating a smoother, straighter, sharper edge. From my experience, this is mostly useful in a commercial kitchen or if you are using your knife to chop a lot, for a long period of time. I personally don’t use mine. I go straight to my sharpener when my knife dulls. Side note: Some sharpeners are designed specifically for one type of knife over another (i.e. Asian vs. German vs. American) so just make sure you read the details before purchasing. Lucky for me, the lovely folks at Cooks Illustrated, wrote THIS in-depth article about the different ways to sharpen and maintain your knives. If you want to read more about it and see a video of how to hone your knife, check it out.